What could be more entertaining and magical than putting food in a box outdoors on a sunny day and enjoying a delicious fully cooked meal just a few hours later? 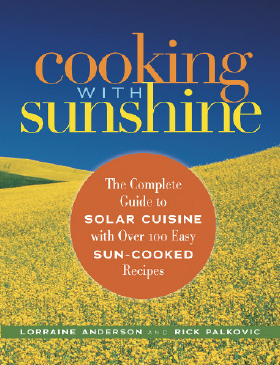 Solar cooking—which uses the sun’s rays as the sole heat source—has been around for centuries and can be done just about anyplace where there’s sun. Not only is it completely safe and simple, but it also saves money on fuel, limits time spent preparing meals, and is kind to the environment—plus, the results are healthy, flavorful, and satisfying. Recipes included… * Crunchy nutty granola * Green bean pate * Artichoke frittata * Savory lentil salad * Tofu enchiladas * Eggplant parmesan * Pesto pizza * Teriyaki salmon * Crustless crab quiche * Tandoori chicken * Burgundy beef stew * Rosemary rice * Garlic-dill buttermilk biscuits * Pumpkin tofu pie * Apricot coconut bars * Peach cobbler cake * …and many more! Click here to view the book’s Table of Contents.